We look at lying as an act of communication, where (i) the proposition that is communicated is not true, (ii) the utterer of the lie knows (or believes) that what she communicates is not true, and (iii) the utterer of the lie intends the lie to be taken as truth. Rather than dwell on the moral issues, we provide a sketch of what goes on logically when a lie is communicated. We present a complete logic of manipulative updating, to analyse the effects of lying in public discourse. Next, we turn to the study of lying in games. First, a game-theoretical analysis is used to explain how the possibility of lying makes such games interesting, and how lying is put to use in optimal strategies for playing the game. Finally, we give a matching logical analysis. Our running example of lying in games is liar's dice. van Ditmarsch, H, van Eijck, D.J.N, Sietsma, F.A.G, & Wang, Y. (2011). On the Logic of Lying. In D.J.N van Eijck & R Verbrugge (Eds. 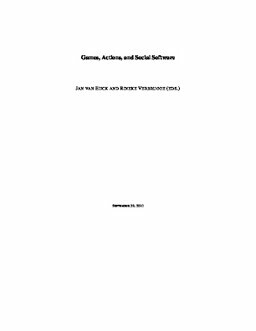 ), Games, Actions and Social Software. Springer.